3 invention projects (in different highly competitive technology areas) completed in a period of 2 months, with 700+ raw ideas culminating in 70+ new concepts. Our structured invention approach radically improves idea productivity of domain experts, irrespective of which domain they belong to! A group of 20 scientists, working through portions of our process, generated more than 100 ideas in a mere 3 hours. In another 3 hours, 7 out of the 20+ concept clusters that emerged were evaluated with respect to technical novelty, business potential and feasibility - preliminary strategic directions were chalked out. Are ideas repeating themselves in your enterprise? Are good ideas struggling to stay alive? Generate truly path-breaking ideas and keep every idea live and productive with Crafitti’s Idea Crafting framework which combines elements of Lean Thinking, Inventive or Design Thinking and Systems Thinking. Ideas are crafted over three distinct phases – Exploration, Ideation and Empowerment. A quick, power-packed intervention to jump-start process innovation by eliminating wastes and accentuating value generating activities. More importantly, the Kaizen Blitz is designed to generate self-sustaining momentum for continuous improvement and innovation. A complete paradigm shift from standard technology landscapes, Crafitti’s TRIZ based Technology Maps trace multiple paths, trees and S-curves of technology evolution. You can use these maps to navigate your way to the cutting edge of technology, identify windows of opportunity and even gaze into the future! A definitive guide to top-down R&D investment, technology and IP strategy. The Innovation Co-Crafter changes the world successfully. He/She brings about the needed change through a systematic process of transforming the system by being a simpleton, scientist and saint. The Co-crafter starts with " I dont know". He reaches to the SOUL of the system by seeing observing understanding and living the system. Only after reaching to the SOUL, the co-crafter start the change process by applying ALVIS thinking. 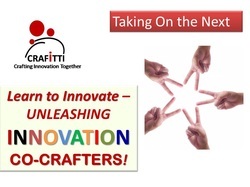 Once the change has been conceptualized and piloted, the co-crafter CRAFT the change to make innovation happens. THIS PROGRAM WILL TRANSFORM YOU INTO AN INNOVATION CO-CRAFTER. THIS IS THE NEEDED SKILL IN THE WORLD THAT IS RAPIDLY CHANGING.